Preparing your vegetable garden for winter can make a big difference in the success and health of your garden next season. 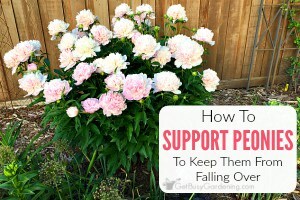 In this post, I will give you steps for winterizing your vegetable garden, and show you how to prepare the soil in the fall. Once the growing season is officially over, it’s time to start getting your vegetable garden ready for winter. Cleaning out your vegetable garden in the fall will help to prevent disease and pest issues next season. Fall is also a great time to test and amend the soil, and to add winter mulch to your vegetable garden. 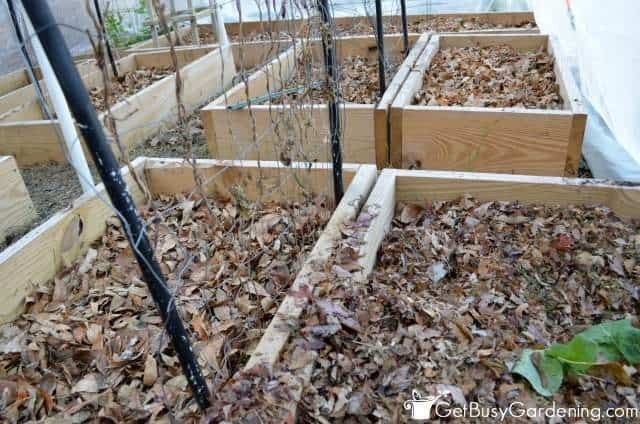 First I will give you the high-level steps for preparing your vegetable garden for winter. 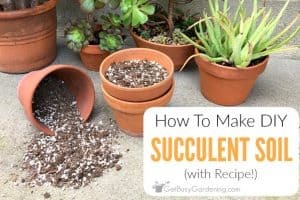 Then in the sections below, I will dive into the details about each step, and show you exactly how to prepare vegetable garden soil for winter. The first step in preparing your vegetable garden for winter is garden cleanup. 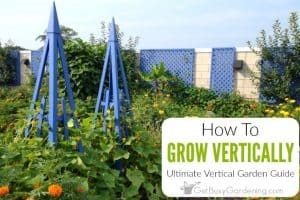 Remove all of the dead plants, and pull out any plant stakes and temporary trellises. Dead vegetable plants are great to add to the compost bin. However, don’t put diseased plant material, or plants that were infested with bugs into your compost bin. Fall composting may not kill pest and disease organisms in time, and they can overwinter in the compost bin. It’s best to destroy diseased plants or throw them into a commercial yard waste bin instead. If your vegetable garden didn’t do as well as you expected this year, it may be because of the soil. 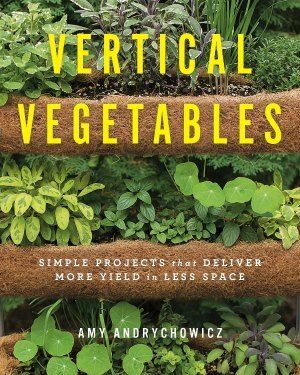 Vegetables grow best in rich, fertile soil. It’s impossible to know the health of your garden soil just by looking at it, it needs to be tested. Fall is a great time to test your garden soil to see exactly what you need to add to it in the next step. Don’t be intimidated by the thought of testing your garden soil. It’s super easy to do it yourself using an inexpensive home soil test kit. If you don’t want to do it yourself, talk to someone at your local garden center to see where you can have your soil tested. An important part of vegetable garden maintenance is to replenish soil nutrients after each growing season. Contrary to popular belief, fall is the best time to amend the soil in your garden. Adding organic material while preparing your vegetable garden for winter means that it will have much longer to break down. Compost is wonderful for amending any type of soil. Take it straight from your own compost bin, or purchase some to add to the soil. You can also buy composted manure and spread that over the garden for added beneficial nutrients. Organic worm castings are also a fantastic soil amendment. Slow release vegetable garden fertilizer can also be added in the fall. I recommend using an organic fertilizer that will help to build the soil, rather than chemical fertilizers which can damage the soil. These days there are tons of organic fertilizers on the market. Two of my favorite brands for use in my vegetable garden are Healthy Grow and Sustane. Other organic materials like leaves, pine needles, grass clippings (don’t use grass clippings if you treat your lawn with chemicals) and coffee grounds are also great for the vegetable garden. These materials can be added directly to the soil, and don’t need to be composted first. Your soil amendments can be left on top of your vegetable garden over winter, but it’s best to mix them into the soil in the fall. You can either use a tiller, or turn the soil by hand with a garden fork or shovel (I love my garden claw tool for this!). It’s not necessary to till the vegetable garden every fall, but tilling does have benefits. If you have hard clay or compacted soil, tilling will break it up. It will also aerate the soil, which helps the organic matter break down faster. Tilling the soil in the fall destroys pests and disease spores that overwinter in the soil as well. The last step to take in preparing your vegetable garden for winter is to add a layer of mulch over the top. Winter mulch protects the soil, holds in the moisture, and prevents weeds from growing (giving you the upper hand on those pesky early spring weeds!). 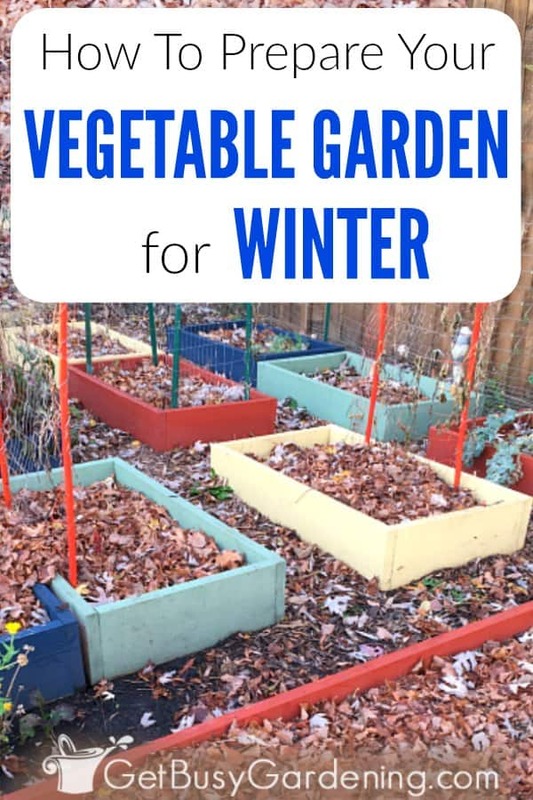 Putting leaves in your vegetable garden is a super easy way to add winter mulch! 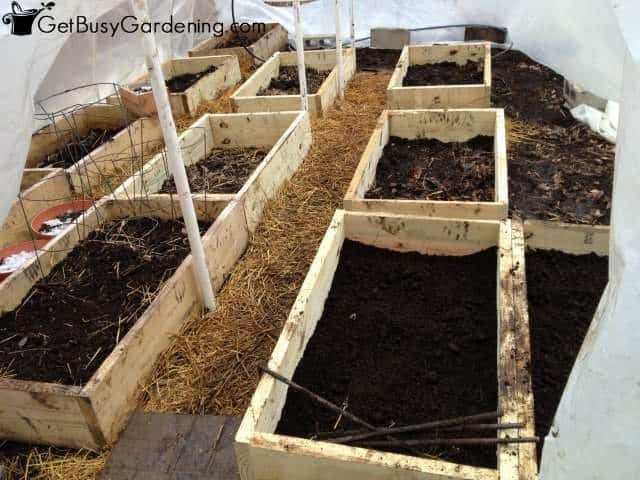 Straw, pine needles and grass clippings are also great examples of winter mulch for a vegetable garden. 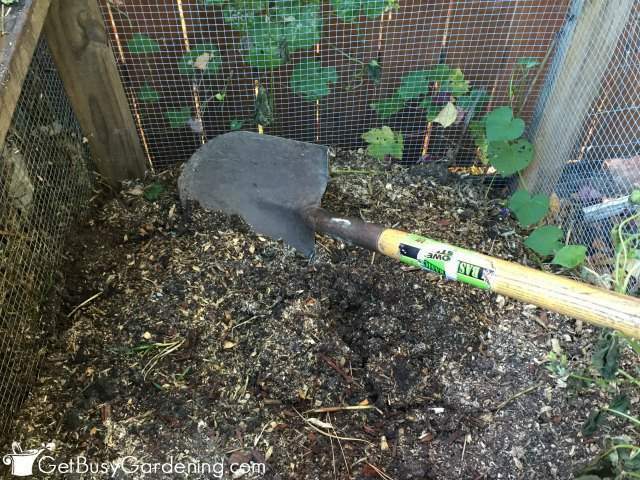 Learn all about mulching your vegetable garden here. Preparing your vegetable garden for winter is important for maintaining a healthy and productive garden. Fall is a busy time of year, and you may be tempted to skip some of these steps. But proper garden soil preparation in the fall will go a long way to improve next years harvest, and the overall health of your vegetable garden. 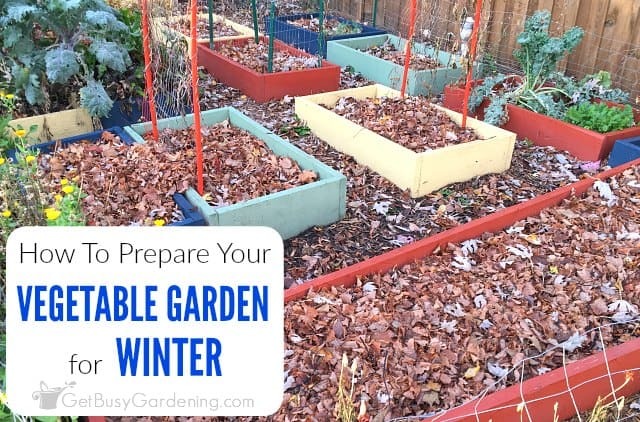 Share your tips for preparing your vegetable garden for winter in the comments section below. 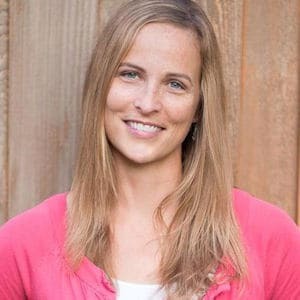 Hi Amy, I'm so glad to find your blog. Have you tried a heavy mulch layer in your veggie garden to prevent the weeds? I garden organically and have two veggies gardens–a potager close to the house, and the large kitchen garden back by the river. I used a really thick layer of mulch in the big garden, with newspaper underneath to smother weeds, and I barely pulled any weeds this season. Yes, mulching the vegetable garden works wonders for keeping the weeds down! Thanks for sharing your experience! Hi Amy. I like the way you think about your garden. Perhaps I'll try the same with my little parsley and other herbs garden. I've never tried anything yet to enhance my garden. You're awesome, thanks for this post. Hi Vanessa, thanks for your nice comment! It takes some work to amend the soil while preparing your garden for winter, but it sure is worth it!! Good luck if you end up trying it out. You'll definitely see a difference. I agree with you Amy. Results entail work and patience, I'd be proud of my garden soon! I'm sharing this. Best of luck to me and to you! Thanks. 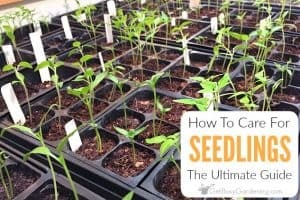 Is it bad to till your garden plants into the soil at the end of the season? It depends on the type of plants you’re talking about. If you have a cover crop that you planted as a green mulch, then you can till that right into the soil. Otherwise, you definitely should not till the vegetable plants into the soil, especially if they had any issues with disease or pests. Diseases and pests can overwinter on the dead plant material, and cause major issues in your garden next year. I recommend removing all of the vegetable plants before you till your garden in the fall.